HOS Smart Home Operator Live is the smart solution for Hotel Room Automation, a full-featured home automation software with support for Apple HomeKit, digitalSTROM, and BACnet protocols, compatible with almost every ip controlled device. The software is an apple iOS application that is configured and controlled from anywhere in the world with any web-enabled iOS device. The System is fully supporting voice commands for all Apple HomeKit paired devices with Siri. WYSIWYG (What You See Is What You Got) technology allow you to use your iPhone/iPad camera to add real rooms / devices photos / skins to be controlled by a simple touch. VR (Virtual Reality) simulate the exact actions of the real push button wall / in-line switches in your room with a set-up easier than setting a channel on your conventional TV. Multi Layers Option Allowing you to Add A transparent layer of alpha pictures on each others to build your own unique custom room design making home control real & more user friendly. 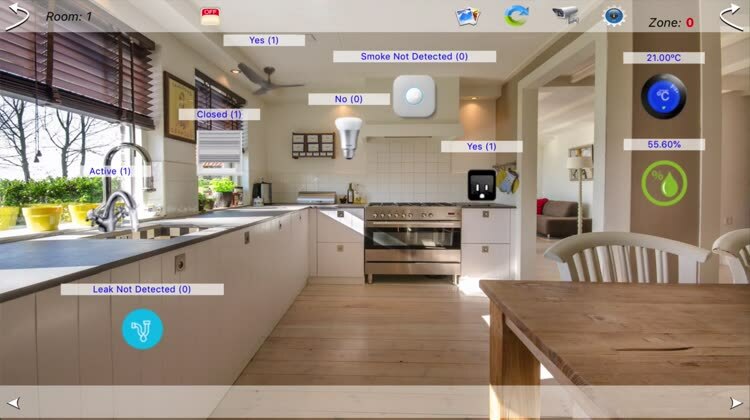 One on one voice assisted live tutorial makes it easy for the average house owner to understand the basics of building a smart home control panel using HOS Live. HOS Smart Home Operator Live Designed to control light switches, thermostats, door locks, audio / video equipment, cameras, garage doors, water valves, energy monitors and much more. With a dedicated library of rooms profiles and remote controls skins professionally designed to meet with most modern houses rooms and devices. HOS Smart Home Operator Live is a companion app which allow you to run a ready made smart home pre prepared by other HOS Products, though it is working with all functions Exactly the same as the full version except that you can not add new devices using this edition, rather you can do so by other HOS Products, Mean while you can change Profiles, Smart Buttons Shapes, Smart Buttons Positions, Room Wallpapers and Even Save all on your personal cloud and move it between other devices Like AppleTV Or Other iPhones/iPads. - Controls light, wall / inline switches, thermostats, door locks, garage doors, water valves, energy monitors, environmental sensors, cameras and more! - Runs all Apple HomeKit, digitalSTROM, KNX, BACnet & TCP/IP devices and protocols. - Can issue spoken messages for alerts, announcement and reminders thru internal Device Speaker and thru ip speakers (SONOS). - Multi profiles allowing you to control as many houses as you wish from one iOS device. - Backup and Restore your houses profiles on your personal computer (no other system do) never been as easy. - WYSIWYG (what you see is what you got) technology allow you to use your iPhone/iPad camera to add real rooms/devices photos / skins to be controlled by a simple touch. - Multi Layers option to combine alpha pictures on each others to add depth to your design. - User friendly animated customized on screen switches using VR (virtual reality) technology simulate the exact actions of the real push button wall / in-line switches with a set-up easier than setting a channel on your conventional TV. - Dedicated library of rooms profiles, alpha layers and remote controls skins professionally designed to meet most modern houses rooms and devices. - Advanced monitor / control view checks indoor / outdoor temperature, humidity, and electricity consumption. - This is an all devices App (iPhone/iPad, Apple Watch, and AppleTV) which means you can pay for one device and download the app for all other devices for free.